I grew deeply interested in the politics of the region; I also like to think that — having come to the area entirely devoid of preconceptions, or anything more than the most rudimentary knowledge, tabula rasa as it were — the opinions and interpretations I developed about the Arab-Israeli conflict were always as near as possible spontaneously personal and first-hand ones; I quickly learned that, as such, they were all too apt to clash with what one might call the prevailing Western orthododoxy of the time. I stayed because I felt personally at home in the region, because my work was so professionally interesting, and my newspaper — unusually — never asked me to go anywhere else. As for the dangers, I definitely didn’t relish them, but unless they had become overwhelming and personal — i.e, for example, if I knew, as I did for a while, that there was a plan to kidnap me — I would never have left the region because of them. DH: Only if Obama summons up the determination to “impose” a solution along the lines I suggest in my book. Though more promising than any other American president in recent times, I don’t think he will. The “friends of Israel” in America are still too strong. RYK: Will there be further constitutional reform in Lebanon? Will the day that a Shia vote is worth the same as a Maronite vote be the day that Hizballah’s forces integrate into a national army? DH: Well, within the complex checks and balances of the “sectarian state,” the Maronites do hold a disproportionate share of political power. But, thanks to constitutional modifications, demography and local and regional developments over time, it is nothing like it used to be when the state first came into being. The Shia were once the underdogs in the system; now they are the most dynamically up-and-coming — indeed perhaps, in practical terms, the single most powerful one. And that in large measure, is thanks to the existence of Hizballah, its military might and its regional, above all Iranian, backing. They won’t be integrated into a national army unless that army can somehow espouse enough of their agenda to satisfy them. Hizballah’s relationship with its environment is a constantly evolving one, but I don’t see that happening in any foreseeable future. RYK: Recently a demonstration for “secularism” was held in Beirut. Could this be the beginning of a significant movement which could finally break down sectarian loyalties? DH: Such manifestations have happened before. They never seem to lead anywhere significant. RYK: Arab world opposition shifts from Leftist to Arabist to Islamist. At the moment Islamism is most prominent, with some Arabist and Leftist ideas subsumed into Islamism. What do you foresee happening next? DH: I foresee that Islamism as a whole — in power as well as in opposition — will in the fullness of time lose its moral ascendancy, just as the other great credos, nationalism — or at least the “nationalism” of the regimes that presume to embody it — and leftism have done. Take the most famous and influential of Islamist regimes, Iran. The new opposition movement, largely from within the ranks of the existing order, is a striking indication of just how much, through the actual exercise of political power, Islamists can discredit themselves and the exalted ideology they uphold — indeed, no doubt, Islam the religion itself as well. RYK: The “resistance front” of Hizballah-Syria-Iran seems to be threatening a unified response to any future Israeli attack outside historical Palestine. Is this a credible threat? Does the changing role of Turkey — its economic and political alliance with Syria and Iran — and the increasingly warm relationship between Russia and Syria, suggest the Middle East may be approaching a “balance of terror” to deter Israel from adventurism? DH: There are increasing indications that the “next war” in the Middle East — what I call the seventh — may spread beyond Lebanon to embrace Hamas in Gaza, Syria and Iran. There is no formal military alliance between them, but Syria and Iran are clearly seeking to inculcate the fear that, if Israel does go to war against its likeliest, first target — Hizballah — they will join in on its side. They might be doing this for deterrent purposes only. Even so the mere hint of it increases the risk that, by accident or design, it will come to pass. Alternatively, of course, if Israel were to hazard a strike on Iran’s nuclear sites, it is highly probable that Hizballah would retaliate with its now vastly replenished stock of missiles. And, this time, that could well escalate into the war with Syria which had failed to materialize in 2006 — with Israel’s so-called Second Lebanon War — and earlier such conflagrations between it and Hizballah. RYK: British journalist and author Robert Fisk says he is utterly pessimistic about the future of the Middle East. He sees it as an unfolding “hell disaster” with no light on the horizon. Are you equally gloomy? 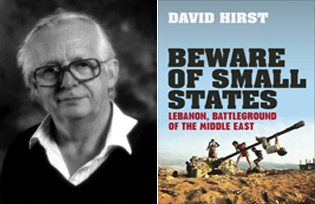 DH: In my experience it has become a truism: things never get better in the Middle East, they just get steadily worse. I have been hearing that — from Arabs of pretty much any condition or background — since the 1967 Arab-Israeli war. I don’t see any likely change in that reality, certainly not, at any rate, till the chief of the region’s many maladies — the Arab/Israel conflict — finds a cure, or a convincing remission. RYK: Beware of Small States strikes exactly the right balance between close detail and broad interpretative sweep. How do you do it? Do you have a guiding principle? DH: Well, I am happy you think so. I don’t think I have a guiding principle. It just comes out that way. I suppose that, apart from trying to get my facts right and my analysis sound, I aim above all at readability and narrative flow. Achieving it is the toughest thing, and sometimes I almost despair of doing so. But the breakthrough always seems to materialize in the end. A nice interview, Robin. These two books are definetly in my shopping list. I will wait until I finish my summer training!